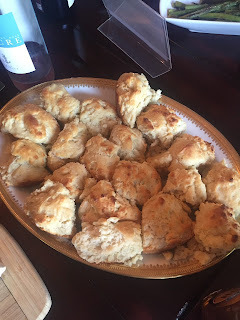 History Undressed: Outlander Kitchen: My Review & a Featured Recipe! Happy Wednesday, friends! Yesterday saw the release of a cookbook, Outlander Kitchen by Theresa Carle-Sansders! I've been wanting to shout about! I had the pleasure of trying three of the recipes this past weekend at a party, and let me just say: all of them WINNERS! I was thrilled to be able to try a few of the recipes pre-release. See my pics and thoughts below! Outlander Kitchen is a not to be missed cookbook for fans of the series, but also fans of really GOOD comfort foods (also, check out her blog!!!). 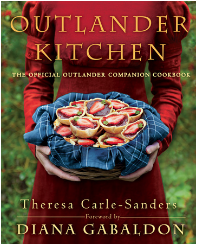 Take a bite out of Diana Gabaldon’s New York Times bestselling Outlander novels, the inspiration for the hit Starz series, with this immersive official cookbook from OutlanderKitchen.com founder Theresa Carle-Sanders! Claire Beauchamp Randall’s incredible journey from postwar Britain to eighteenth-century Scotland and France is a feast for all five senses, and taste is no exception. From Claire’s first lonely bowl of porridge at Castle Leoch to the decadent roast beef served after her hasty wedding to Highland warrior Jamie Fraser, from gypsy stew and jam tarts to fried chicken and buttermilk drop biscuits, there are enough mouth-watering meals along the way to whet the appetite of even the most demanding palate. With full-color photographs and plenty of extras—including cocktails, condiments, and preserves—Outlander Kitchen is an entertainment experience to savor, a wide-ranging culinary crash course, and a time machine all rolled into one. Forget bon appétit. As the Scots say, ith do leòr! 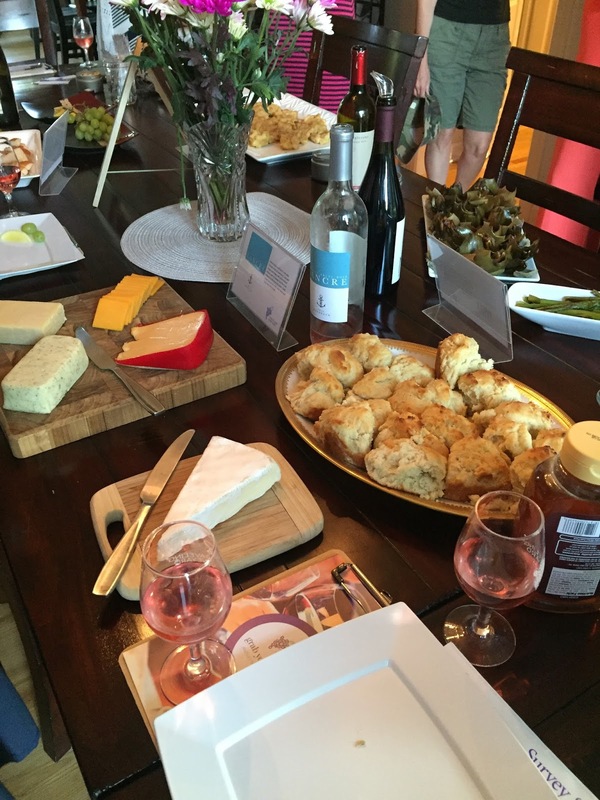 When I was approached by the author/chef and publisher, I thought it would be a great idea to try out a few of the recipes paired with wines and get a few opinions on the recipes from my guests. We tried three of the recipes, Goat Cheese & Bacon Tarts, Apple Fritters and Mrs. Bug's Buttermilk Biscuits. I'll start with the Goat Cheese & Bacon Tarts. These were FREAKING AMAZING! The recipe calls for puff pastry which you can buy in the store, or there is a recipe in the book. To save time, I actually used the puff pastry cups you can purchase in the frozen section. These tarts were literally FILLED with flavor. We paired the tarts with a red zinfandel, but I thought it tasted equally good with a dry rose and darker red wine (pinotage from South Africa). This was the one thing on the table that they didn't leave me any leftovers of! The fried sage on top I think it was really brought the tarts together, too, and so many people were skeptical of eating the sage. But, frying it actually changed the usually strong, earthy flavor into an explosion of deliciousness. Plus, I love goat cheese, so, it was a win-win! The next recipe we tried was Mrs. Bug's Buttermilk Biscuits! They were so freaking good--and I stole a couple from my guests to try the next day. Some biscuits don't last overnight. These DID. We had a biscuit connoisseur with us, and she said they were the best she'd ever had. They were moist, dense and made me want to curl up on my couch and re-watch The Wedding episode. We paired the biscuits with cheese and a French dry rose. YUM! When I tried them the next morning, I drizzled them with honey and sipped my coffee. A versatile hunk of delicious carbs. Onto the Apple Fritters! I am an apple fritter snob. When I was pregnant with princess #3 I tried apple fritters anywhere I could get them. That was my drug of choice. But when you buy a fritter normally, they aren't bite sized or filled with apples pre-soaked in Scotch Whisky. 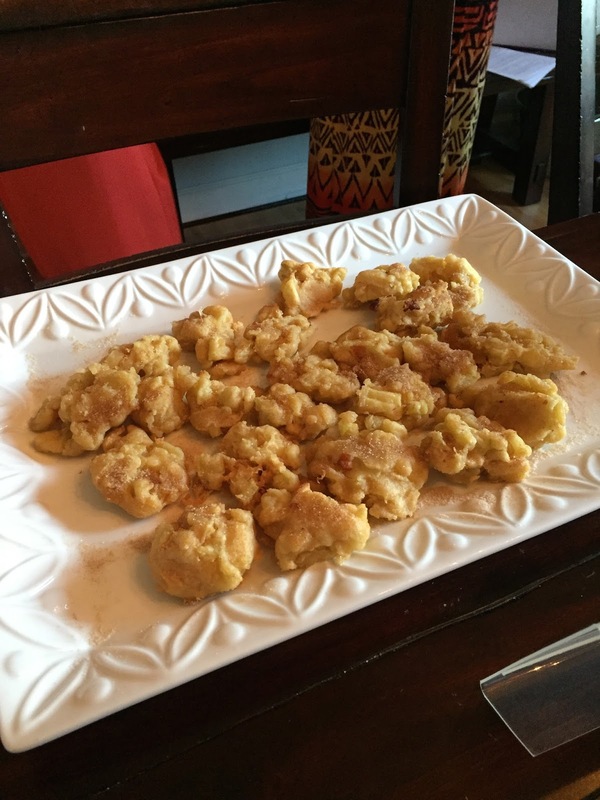 So, if you're looking for a grown up fritter--this is the way to go! Also, a note to you on frying -- the oil has to be the right temperature for the fritters not to fall apart. We used a cook thermometer to test the oil. (We dropped it in, hold on tight to it, lol). We paired these with a sparkling dessert wine. SO GOOD! Because the Goat Cheese & Bacon Tarts were the favorite of the party, I'm going to post the recipe below and insist you make them!!! Virtually no time at all. You defrost and pre-cook the pastry cups. If you're lazy about frying, like me, you bake you bacon at 425 in the oven fro 15-20 minutes. I was doing other stuff while waiting for the timer. Also, for "frying" the sage--I did that in the oven, too. I'm the worst fryer ever--see dropping thermometer into boiling oil above! It was a savoury made of goat’s meat and bacon, and he saw Fergus’s prominent Adam’s apple bob in the slender throat at the smell of it. He knew they saved the best of the food for him; it didn’t take much looking at the pinched faces across the table. When he came, he brought what meat he could, snared rabbits or grouse, sometimes a nest of plover’s eggs—but it was never enough, for a house where hospitality must stretch to cover the needs of not only family and servants, but the families of the murdered Kirby and Murray. At least until spring, the widows and children of his tenants must bide here, and he must do his best to feed them. “Sit down by me,” he said to Jenny, taking her arm and gently guiding her to a seat on the bench beside him. She looked surprised—it was her habit to wait on him when he came—but sat down gladly enough. It was late, and she was tired; he could see the dark smudges beneath her eyes. Vegetarian options were tough to come by in the eighteenth century, and goat meat can be hard to find for some in the twenty-first, so I’m claiming food-from-fiction license with this switch-up from a meat pie to one-bite puff pastry rounds topped with a savory goat cheese spread. 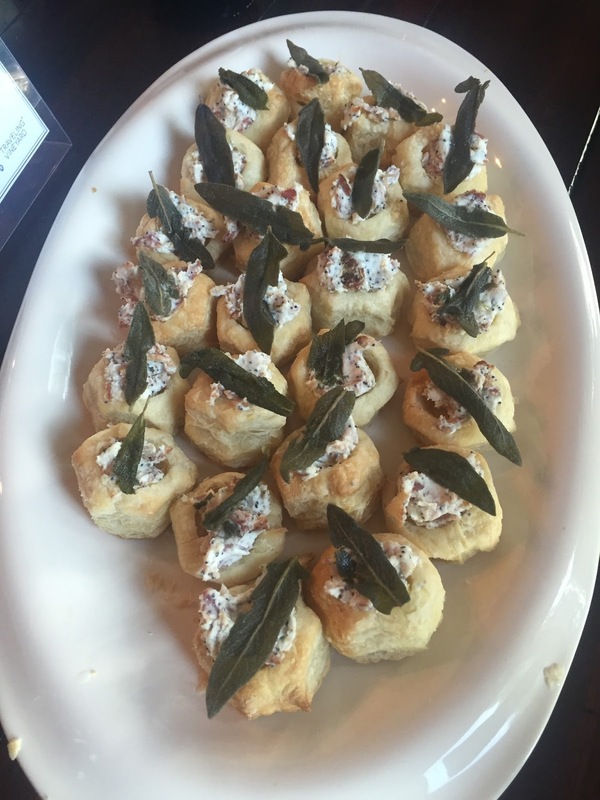 A delicious addition to the snack table at your next book club meeting or office party. I'm definitely going to check this book out.